This review of the Bio Bidet BB-2000 is written by Jbidet.com. 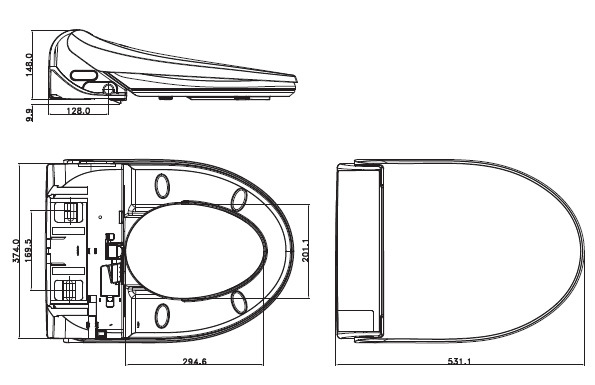 The BB-2000 is one of the most advanced bidet toilet seat that Bio Bidet has put together. If we compared it to the Toto brand, its price and features would resemble closest to the S300e or S350e. Without further ado, here is a look at the BB-2000 in depth. First let’s take a look at the design of the BB-2000 in terms of its appearance, dimensions, and built. Immediately you can see that the BB-2000 is a sleek looking toilet seat bidet. It has stainless steel parts (like the nozzle) and to the side you will notice a touch screen side panel with a night light. The bidet is operated by remote control which they call a “U-Pick” remote. That’s because you can pick between black or white, whichever fits your bathroom décor or personal taste. The remote also gives the aura of a luxury product. At first glance, some of the buttons look familiar to anyone who’s ever used a toilet seat bidet, but other buttons look like they’re from space. It will take some time to learn what those buttons do. The remote doesn’t have labels to tell you what each function does, so even if you learn the buttons, this could be bad news if your toilet is intended for guests. The remote is powered by two AAA batteries instead of AA batteries usually in other remotes. You will likely have to replace them more often. The BB-2000 is only for elongated toilets. You should be able to see what kind of toilet you have simply by looking at it. Precisely, elongated toilets are about 18.5 inches long from the mounting bolts at the back to the front, and round toilets are about 16.5 inches. It will fit either your 1 piece elongated toilet or 2 piece elongated toilet. However, it may not fit your 1 piece French curve toilet, if you have one. We recommend checking with the manufacturer if you’re not sure. The BB-2000 dimensions are 20.9” long, 15.4” wide, and 6” at the highest point in the back. If you compare the dimensions of Toto’s top bidet toilet seat (elongated version) with the BB-2000, which is Bio Bidet’s most advanced, their lengths and widths are about the same, but the Toto S350e is about 2 inches thinner, measuring just under 4”. In fact the Toto S350e and S300e are the slimmest toilet seat bidets on the market, if that’s something you’re looking for. 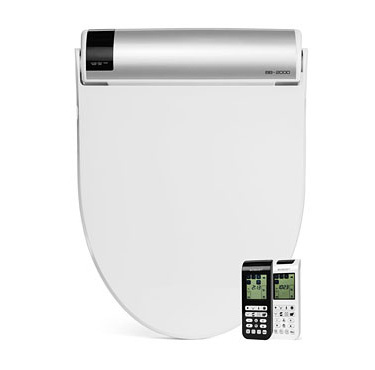 The Bio Bidet BB-2000 comes in white or beige and once again you can choose between white and black for the remote. There are three dedicated cleansing modes: Posterior, Feminine, and Turbo/Vortex wash. The Posterior wash cleans the back, the Feminine wash cleans the feminine area, and the Turbo/Vortex wash is a more focused wash for the back. While using the Posterior or Feminine sprays, you can turn on the oscillating feature which will move the wand back and forth to wash more thoroughly. You can also turn on the massage feature which will alternate the water pressure between soft and strong, like you’re being given a massage. The cleansing functions of the BB-2000 are customizable. The water and seat temperature can be adjusted to three different levels. They are low (93.2°F/34°C), medium (98.6°F/37°C), and high (104°F/40°C). The nozzle position and water pressure can be adjusted to five different levels. There is also an air dryer with adjustable temperatures. The Bio Bidet BB-2000 has something called an Economy mode. When this feature is turned on, it will save energy by maintaining the water and seat temperature at 89.6°F/32°C. 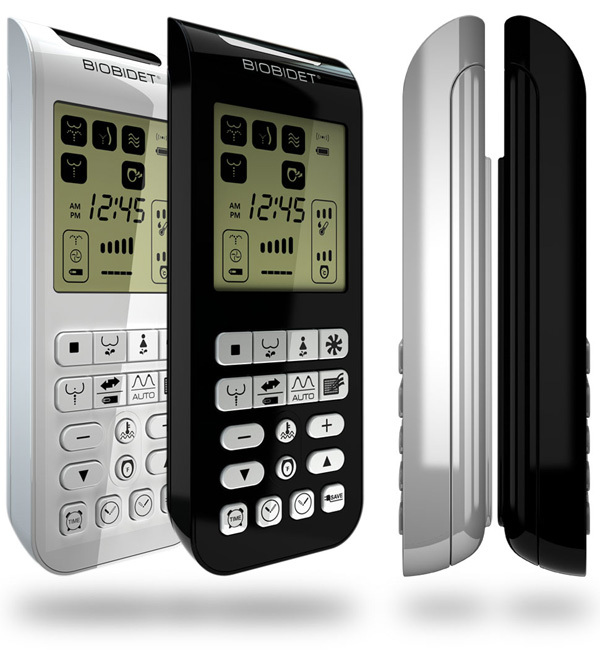 The BB-2000 Economy mode is slightly different than the one in the BB-1000, which prioritizes saving energy by only lowering the water temperature. The nozzle cleans automatically before and after each use on the BB-2000. There is also a function called the Nozzle Shower which is turned on by one of those mysterious buttons that you have to learn. The Nozzle Shower essentially gives the the nozzle a good clean. Water will flow out and the nozzle will move back and forth against a scrubber. You can also extend the nozzle out to give it a manual wipe. Just press “Posterior” for about three seconds and the nozzle will come out. When you’re finished you can press the “Stop” to return the nozzle. There is a deodorizer for the BB-2000. It is simply fan that turns on as soon as you sit down to keep the smell from spreading. Finally, many people ask this question: Do you need a hot water supply? The answer is no. The BB-2000 has this thing called a hybrid heating system which combines instant heating and tank heating. Most bidet toilet seats work on either system, with instant heating being more common. With instant heating, water passes through a heated coil which means that you might get some cold water before it warms up. With tank heating, a water tank reservoir is used to store warm water, so you won’t get cold water but there is a limit as to how much warm water it can store. Bio Bidet developed a hybrid system for the BB-2000 that uses both systems and allows consistent water flow and temperature. Why the Bio Bidet BB-2000? Choosing a bidet toilet seat can be difficult. You will have to pick from many makes and models to find one that is reliable, within your budget, and that you’ll enjoy using multiple times a year for many, many years. We completely understand. That’s why to help with your decision, we put together some reasons why the Bio Bidet BB-2000 might be the one you’re looking for. The first drawback with this toilet seat bidet is the remote. Most remotes use AA batteries but this one uses AAA batteries, which will probably have to be replaced more frequently. Also, as with other Bio Bidet toilet seats we’re not really big fans of the Economy modes that lower water temperature. The energy saving functions on the Toto are much more customizable and save energy by lowering the less important features (heated seat) rather than the important ones (warm water spray). That said, you probably won’t notice a difference in function when the BB-2000 is put in energy saving mode because it uses a hybrid heating system that keeps water warm and allows warm water to flow consistently. Overall the Bio Bidet BB-2000 is a great product. It looks nice and it has some cool features that are unique like the hybrid heating system and the self-scrubbing nozzle. Also you are covered 100% for all parts and labor for three years. Whereas other toilet seat bidets offer one year of full coverage warranty. You can buy the BB-2000 conveniently online or at your local home improvement store. Just remember to choose your remote color.